Guests at a banquet choosing meals. Some might have dessert or a salad. Ingredients a chef uses in various recipes (each ingredient can be used many times). The key to diagramming a Matching game is to set up we call The Grid. List one set of variables vertically and list the other set horizontally, creating a grid of boxes. Start to add information to your Grid, starting with the fixed conditions. When you write information in the boxes, place “not conditions” to the top of the individual boxes and place “fixed conditions” in the center part of the box. Look over The Grid and see if there are any additional conclusions that you can make if you consider each box of the matrix in relation to the other boxes or if you consider the conditions summarized at the side with respect to any of the boxes in The Grid. Now that The Grid is complete for this game, we can move on to the questions. Press Pause at the start of each question then try to solve them. Priscilla has a small store where she sells upholstered furniture. She sells armchairs, couches, loveseats, futons, and recliners covered in several different fabrics: floral, plaid, vertically striped, solid, or mixed. She wants to display examples of her work in the storefront window. Because the window is quite small, only one piece of furniture can be displayed at a time. Priscilla plans to display a different item of furniture for each of the next five months. Also, each of the five items of furniture will be covered in a different fabric. Priscilla plans her display according to the following conditions: The couch must be displayed before the futon. The loveseat can only be displayed after the recliner. The plaid item of furniture must be displayed before the one covered in mixed fabric. The vertically striped piece of furniture must be displayed in the third month. The futon must be covered in floral fabric. Which of the following items of furniture could be displayed in the first month? (A) The loveseat must be displayed in the first month. (B) The futon must be displayed in the fourth month. (C) The recliner must be displayed in the first month. (D) The piece of furniture covered in solid fabric must be displayed in the fifth month. (E) The armchair must be displayed in the third month. The first step is to identify the problem at-hand. We are asked to assign five different items of furniture to five different months with five different fabrics. It is a characteristic game: we are asked to make a schedule taking into consideration at least two different characteristics. Earlier, we had mentioned that it is important to create a roster of the elements of a game. For characteristic games, however, the elements may be more straightforward, such as the months of the week, Monday through Friday, or the numbers one through seven, etc. For this game, the elements are five months, which we can simply number as one through five. Fabric = floral, plaid, vertically striped, solid, and mixed. Notice that we have used upper case letters for one list and lower case letters for the other, so we can keep the two characteristics separate. (You then might end up with trying to schedule things like a futon recliner or a floral plaid, instead of a floral futon and plaid recliner! Now that we have converted the lists to a more abbreviated form, what next? While there is not a single diagramming approach that works well for all characteristic games, these game problems are usually best solved with a matrix. A matrix can be thought of as a kind of chart that we create with the game’s elements in columns and the characteristics in rows (or vice versa, either direction will work). Again, this is easier to show than to describe. So, what would the matrix look like for the above sample game? Now, what information can we place in our matrix? As with all of our game diagramming, let’s start with the fixed conditions. We have one easy one, the first condition. 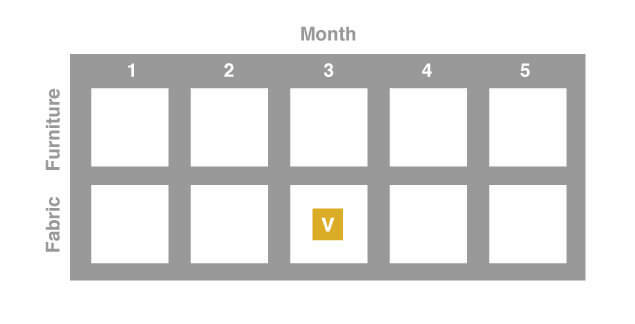 In this case, we know that the vertically striped piece of furniture must be displayed in the third month so we can put our vertically striped symbol (v) into the second row under column 3 (for the third month). Can we put anything else into our matrix right away? Well, the first two conditions tell us that the couch must be displayed before the futon, and the recliner before the loveseat. That means that neither the futon nor the loveseat can possibly be displayed in the first month, since the couch and recliner have not yet been displayed. So we can fill these into the matrix also, as ^F and ^L for not futon and not loveseat. You might think that these are the only two pieces of information in these two conditions, but is there anything else that we can conclude from these statements? If we think about the logic behind it, the couch needs to be shown before the futon, and the recliner before the loveseat, the couch and recliner cannot be the pieces of furniture displayed in the last month. We can add these two pieces of information to the matrix also, in the top box of the last column as ^C and ^R. Further, we still have the original statement that the couch precedes the futon and the recliner precedes the loveseat. To be sure we do not forget this important information, we will write these symbolically to the side of our matrix as C < F and R < L.
Can we do anything with the condition stating that the plaid piece of furniture needs to be displayed before the mixed one? We can also conclude that the mixed piece of furniture cannot be displayed in the first month, and the plaid cannot be displayed in the last month. We represent this as ^m for not mixed and ^p for not plaid. We are left with one condition, that the futon will be floral. If we look at our matrix, we see that the futon cannot be displayed in the first month, so we can also conclude that the material of fabric for that first month cannot be floral. If we look over our matrix, we can see that we already know that the piece of furniture displayed in the third month is vertically striped. If it is vertically striped, we know it can’t be the futon (which must be floral), so we can add a ~F to the top box of month 3. Great. We have a lot of information about which pieces cannot be displayed in certain months, and that information will be very helpful to us. One other thing to note about the way in which information has been put into the matrix is that it is a good idea to put “not conditions” to the top of the individual boxes, and to put “fixed conditions” in the center part of the box. For this game, all of the conditions have now been used in some form and filled into the matrix, and all additional information has been written to the side. It will not always be the case that at least part of every condition will be able to be added in some form to the matrix. Let’s now look at some sample questions and then work through how to best solve them with the help of our matrix. To solve this, let’s look at what we have already written under the first month column. We have a ^F, ^L, ^f, and ^m. Now let’s look through the answer choices. Choice A is not correct because the futon cannot be displayed. Just looking at the first column, we cannot rule out Choice B, so let’s come back to that one. Choice C is not correct because we know that we cannot have the mixed fabric. Choice D is not correct because we cannot have the loveseat in the first month. Choice E, the plaid couch, sounds reasonable, as there is nothing in our first column to indicate that this is not a possibility. So now we have narrowed it down to two choices, B and E. Let’s now consider the rest of our matrix. Is there any other box filled in that has to do with recliners or futons? Just that the futon cannot be in the third month and the recliner cannot be in the last month, so those conditions do not help us figure out what can happen in the first month. What about the conditions of vertically striped or plaid? Are there any other conditions filled in to distinguish between those possibilities? 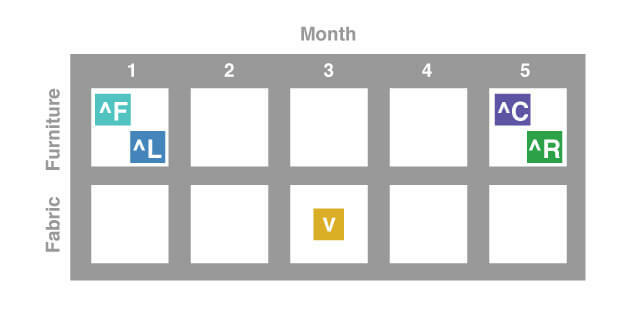 Yes, we know that the vertically striped piece of furniture will be displayed in the third month, therefore we can eliminate Choice B as a possibility. Choice E is the correct answer. You should always look over the matrix and see if there are any additional conclusions that you can make if you just consider each box of the matrix in relation to the other boxes. For example, we had already filled in the fabric box for the third month as vertically striped (v). What does this tell us about the fabrics in all the months? They can’t be vertically striped! Let’s try some more questions. Choice A seems to work, but let’s check the other choices. Choice B is incorrect because the futon can only be displayed after the couch has been displayed. 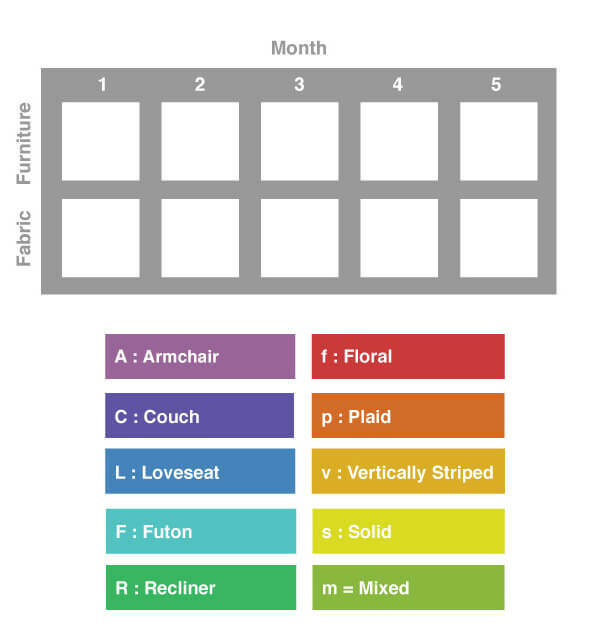 Choice C is incorrect because the futon cannot be displayed in the third month because the futon must be floral and the piece of furniture being displayed in the third month is vertically striped. Choices D and E are incorrect because the loveseat cannot precede the recliner. Therefore choice A is the correct answer. First, let’s see if we can add the new piece of information from the question to our matrix. What do we know about when the vertically striped piece of furniture must be displayed? It must be shown in the third month. Therefore the loveseat must be displayed before that, which would be either the first or second months. Now let’s look at those boxes. In the box for the first month, we have the ^L symbol for not loveseat. Since this possibility is eliminated, the loveseat must be displayed in month 2, so we can now add this piece of information to our matrix. Choice A is not correct. The futon in the fourth month? It’s possible. Choice C, the recliner in the first month- we just figured out that this must be true. Choice C is the correct answer. What is the best strategy if you don’t immediately see the right answer? When you are asked whether statements must be true, the easiest way to check this is to try to find another arrangement.